Classic 60's, 70's, 80's rock and more, great singer, in the style of all those great rock bands that also had amazing horn sections with special guest solos by Arturo Sandoval, Walt Johnson, Lynn Nicholson, Serafin Aguilar. 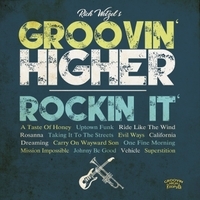 NW musicians, led by trumpeter Rich Wetzel and this NEW version of his band, Groovin' Higher, has evolved over time from a jazz orchestra to a jazz-rock group and now with this project has that classic 70's rock band with horns, amazing rhythm section, guitar, singer /. vocals, sound like Tower of Power or CHASE, with a little Maynard Ferguson and classic rock!!! Some very special guest soloists are also featured on some tracks, heroes of mine to include Arturo Sandoval, Walt Johnson, Lynn Nicholson and Serafin Aguilar. This is our most exciting CD yet, you will love it!! !